Discernment was our focus for this week. 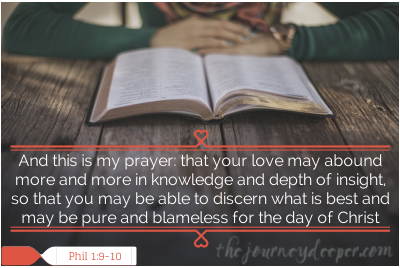 Actually, discernment has been my prayer focus for a while now, as I trying to figure out which path(s) I should take in life. To discern is to be able to distinguish things from each other, despite close similarities and/or an obscured view. Spiritually, discernment is ultimately the ability to distinguish good from evil, the ability to pick out the wolf from among the sheep. Hebrews 5: 11-14 tells us that discernment is a sharpness in understanding which comes from maturity in God. We learn discernment with practice, as we mature in our walk with God. From Solomon, to whom God gave wisdom, discernment and breadth of understanding (1 Kings 4:29), we know that discernment is also closely linked to wisdom. But how do we get this discernment? Romans 12:2 (after the part about not being conformed to this world but being transformed by the renewing of your mind) tells us why we should not be conformed to the world but instead transformed. And why is that? To be able to discern the good, acceptable and perfect will of God. It is this lack of conformation, and the accompanying mental transformation that brings discernment. And finally, 1 Corinthians 2:6-16 sums it up nicely. The wisdom that we seek is not one of this world, or of this age, but is instead a secret wisdom hidden in God. Such things are revealed to God through the Holy Spirit, which searches everything, even the depths of God. (Isn't that poetic?) By this spirit, we understand the gifts given to us by God, those which seem like foolishness to the unspiritual, because we can only understand them by spiritual discernment. In seeking God, we learn from him, through His Spirit, wisdom and discernment, which guides us in all that we do in this world. Discernment teaches us to distinguish the will of God. And it is by his will that we should all walk. Be blessed and shine with discernment! The points you've made are absolutely true! In a fallen world,discerment is needed as well as necessary to survive the wiles of the enemy. Without discernment,our judgment becomes clouded,making it difficult to avoid the snares,traps and pitfalls of life. Having an intimate relationship with God and a hunger for His Word, are beneficial in the life of a Christian because it keeps us sensitive to the nudging of the Spirit. This is soo true... discernment is definitely an effect of intimacy with God. This week's post on desperation (here) touches on that hunger that you mentioned as well.